The thick incense here was initially annoying, until I figured out that it was handy to keep the mosquitoes away. I was told that the papyrus rushes on the floor are actually getting kinda hard to find. Legend has it that coffee was first discovered in Ethiopia when a herdsman from the Kaffa region noticed that when his goats ate the berries off a particular bush, they got really frisky and ecstatic, dancing around on their hind legs. He took the cherry (a quirk of coffee: the plural and singular for the raw berries are the same: “cherry”) to the local monks, who condemned it as sinful and tossed it into the fire. Well, in the fire, the cherry split open and people started “waking up and smelling the coffee” as it were. They raked the roasted beans out of the coals, crushed them up and put them in boiling water to distill out the essence – a process that in its basic steps, really hasn’t changed over the millennia. The other students were making fun of this poor guy for doing “woman’s work.” The student kind of reddened at this, but kept on with his duty. In the lower left, you see the popcorn; in some of the videos, you can see the giant round of bread and the roasted barley. Anyway, the ceremony starts with the scattering of papyrus reeds on the floor and the burning of strong, sweet incense. A young girl dressed in a traditional white dress with colorful woven borders, sits on a stool, next to a clay brazier filled with heavy chunks of charcoal. She washed a handful of beans in the heated pan, and then shakes away the husks. When the beans have been roasted to shiny blackness, she grinds them up with a mortar and long-handled pestle. The grind is pretty uneven – it varies all the way from powdery espresso-type to coarse French Press consistency, all in the same batch. The maiden slowly stirs the ground-up coffee into a “jebena” which is a round-bottomed black pottery coffee pot, with a straw lid. 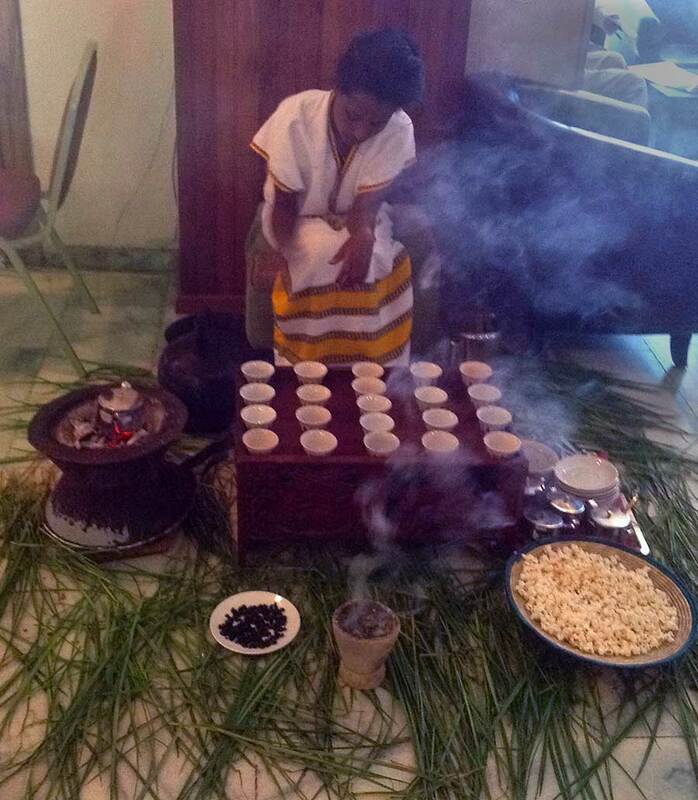 In the video below, you can see some of my students doing the coffee ceremony. A lot of the guys were teasing the male students who were working hard to fan the stubborn charcoal into life. “This is a real post-feminist ceremony here – we have the men doing all the work, while the women get to lean back and laugh,” said one student. I gave him props for using the phrase “post-feminist”, while my other students reddened under the good-natured needling. 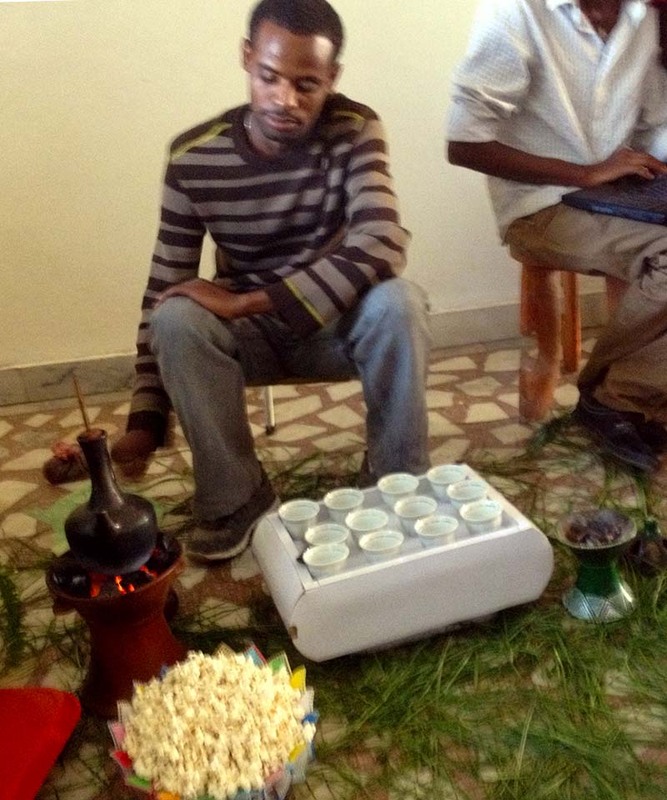 In Addis Ababa, the participants in the coffee ceremonies loaded up their tiny china cups with spoon after spoon of sugar; to the point where, when one of them prepped a cup for me, the coffee was almost syrupy and chewy. Reminded me of some of the Turkish coffee I had in Georgia and Azerbaijan, where the combined caffeine and sugar one tiny cup would jack you up all morning. Red Bull and Jolt Cola have got nothin’ on this rocket fuel. Out in the countryside, the participants in the coffee ceremony use salt instead of sugar, which is a real acquired taste, I must say. I had to gulp down a whole litre of water during one ceremony, because the combination of caffeine and salt was making my mouth as dry as the Harar desert. Traditionally, roasted barley, popcorn, peanuts or small cookies are also served; passed around on big platters, you are expected to take a handful and use them to soak up all the caffeine singing in your belly. The barley is actually pretty tasty; in the morning ceremonies, I kinda felt like I was having dry cereal. Also, the incense that I kinda cursed for making my eyes itch in Addis, I found myself praising out in the countryside, because at least it chased away the clouds of mosquitoes and biting flies. Serving the coffee is very much a not-so-subtle reminder of social ranking; the eldest and most powerful in the village are served first, and then after that, in descending order. As the visiting ferengi, I was kind of a wild card; in some places, they tried to serve me first, in others, they ostentatiously passed me by to pour coffee into the tiny cups of people on the other side of the room. And yes, the coffee was good. It was not like the smoothed-out, characterless drivel that is shoveled out of chain coffee shops, or (shudder) drooled out of urns in Quickie Mart truck stops across the U.S. The coffee served in these ceremonies is intense and has an almost wine-like flavor; it sticks with you for a while. The ceremony traditionally has three rounds – the coffee is seved in shotglass-sized cups, so it’s not like drinking American-style coffee in municipal-stadium sized mugs, where you get ½ litre at a gulp. The first rounds is called Abol, and it’s when everyone murmurs compliments to how good the coffee is, how nice the ceremony is, etc. 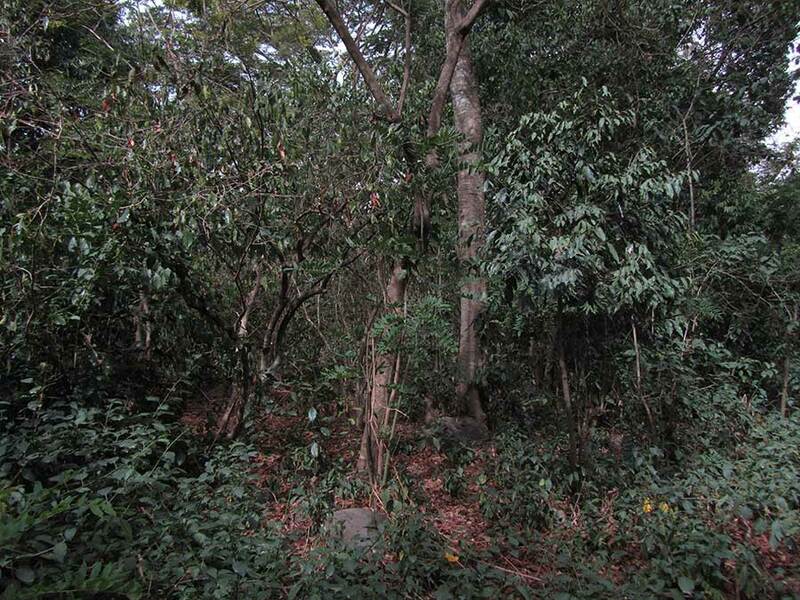 These are the coffee plants that grow wild all over these islands. The last round of coffee is the most important, and to leave before it is considered a grave insult. It’s called “Baraka” and it is the one that supposedly contains the good luck and blessing in it. By this point, the business discussions are usually entering their end stages, the elders have adopted their usual scowls, and the last round is greeted with more praise for the maiden serving it. I have brought back with me a couple of kilos of the rare coffee from the monasteries out on Tana Lake. These are unroasted, and I hope to bring them to the local coffee experts to roast and sample, to see if there is anything truly remarkable about them. Supposedly, since they are from plants that have been isolated on these islands for nearly a thousand years, the coffee has a flavor and characteristic that has been lost by the plants on the mainland, that have been crossbred, hybridized, and thus, bastardized from the original genetic line.